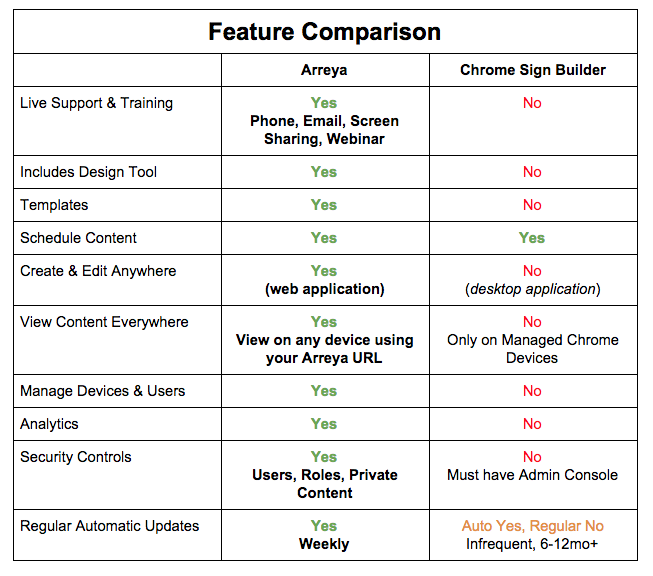 We get a lot of questions about how Chrome Sign Builder different from Arreya Digital Signage. With a free tool called Chrome Sign Builder you have everything you need for Chrome Signs, right? Not quite. The name Chrome Sign Builder implies that you can build digital signs, but the reality is quite different. Chrome Sign Builder has one primary function – Scheduling existing content that is already hosted online. I think It would be a better fit to call it Chrome Sign Scheduler. With this in mind, you have to ask – if it only schedules, how do you create and manage the content? 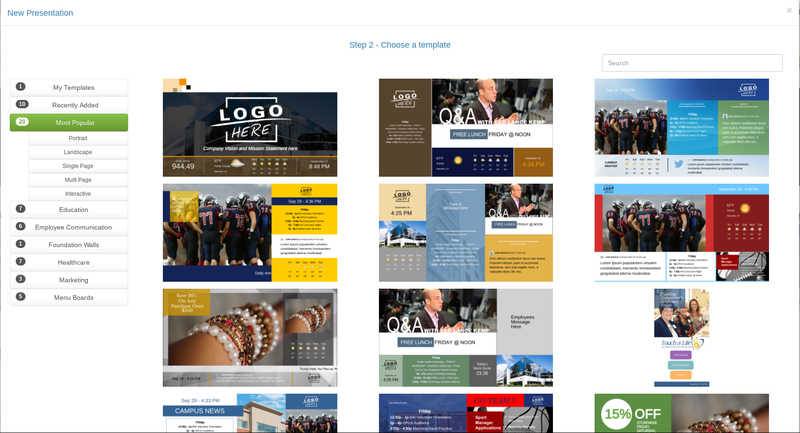 Keep reading to see more about how the Arreya experience is different from Chrome Sign Builder. Need to do more than that? Then Chrome Sign Builder isn’t going to cut it. Want to edit your existing schedule? Nope, that option hasn’t arrived since being requested back in 2015. Every time you want to make a change to your existing schedule you will need to start over completely. There’s also some issues with the core feature of Sign Builder that will throw a wrench in your signage once it’s up and running – like this one where schedules are off by a day every new year. But, it is free. Sometimes you do get what you pay for. Arreya on the other hand, provides you with a complete easy-to-use package with Templates, Arreya Creative Studio, Scheduling, Management, Analytics, and more. Of course, this package wouldn’t be complete without our outstanding support and training that is included with every subscription. Take a look at the chart and compare for yourself. If free is your primary motivation and you are willing to spend time creating a system to manage the content, Sign Builder may be a good fit. It’s great for DIY folks and technical people like IT or developers that understand the Admin Console, policies for kiosk apps, and have a handle on how to create and host their own content – along with the time to do it all. It will be up to you to generate policies and apply them to the correct OU to perform an update to your signage. Keep in mind though – time is money. You will be spending an unknown amount of time piecing together parts to create a system, not including the time it will take to keep it running day to day.So, who would use Chrome Sign Builder if all it can do is schedule content? Arreya provides a library of pre-made templates that cover our most common use cases and variations. This includes different industries like Retail, Healthcare, and Education. There are also different formats within each category like Portrait, Landscape, and Interactive. Templates can be modified by you for any look and feel, nothing is locked in stone. One of the biggest features Arreya provides, and that sets us apart from other solutions, is the Arreya Creative Studio. The Arreya Creative Studio gives you a web based tool to create your content. While the main interface is similar in layout and features to other presentation and graphics programs we have enabled advanced tools like transparency, drop shadows, layers, and filters. Combine these tools with our widgets for Sheets, Slides, Calendar, YouTube, Twitter, and many more. You have complete control over your design and we give you the tools to easily integrate content from the web. Arreya makes it easy to bring in almost any type of file. We make it easy with automatic conversion, and we support transparency. Photos, Documents, etc. Videos? No problem. We convert everything automatically. Even things like Adobe Photoshop, Adobe Illustrator documents, and CAD files. Already have media assets in another service like Dropbox, Drive, or Facebook? We can import media from almost anywhere, saving you the time and hassle of moving files around. If you are on a device with a camera attached you can also record photos or video directly in to your Arreya media library. Need to make changes to an image? Click edit on an image and we embed the Adobe Creative Cloud photo editor. Crop, Resize, Rotate, Touch Up and add Text, all within your browser. Nothing to download, no files to manage. What good is content if you don’t know how well it performs? 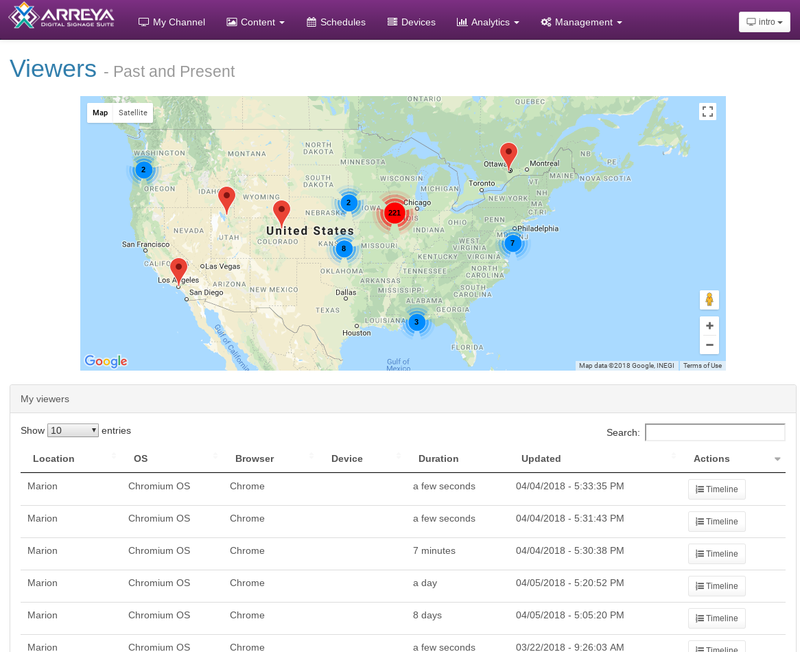 Arreya includes real time analytics. With Analytics you can tell who is interacting with your content, what content they interact with, where they are at, and what device they are using. When you combine this with interactive content and the ability to share via your Arreya URL you can actually see which content is most popular and how users interact with your content. Arreya also supports private content. Yes, you have a public URL, and yes, you can make it private too. Many private organizations are successfully using Arreya for their private, internal communications – office digital signage, call center digital signage, employee kiosks, multiple location and enterprise digital signage – even for remote employees. 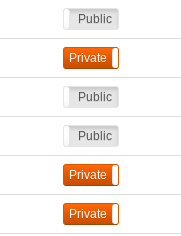 If you need to keep your Arreya Channel private, just change the switch from public to private. Under strict rules to keep content on your internal Network? Arreya can still work for you. Using our RSS and website widgets we can pull data from Local URLs so sensitive content never has to leave your network. Images, Videos, Text, Data Tables, Lists, and more. Check it out – we even share our phone number – 319-294-6671. Have a question? Give us a call. You will talk to our team and get direct answers to your questions. Of all the feedback we receive, our outstanding support is #1. We’re here to answer questions before and after the sale. Need training? We record 1 on 1 training as part of your onboarding, but if you need more, contact us and we can set up a custom training session. We update Arreya every week. Sometimes it is big new features, sometimes it is little fixes. 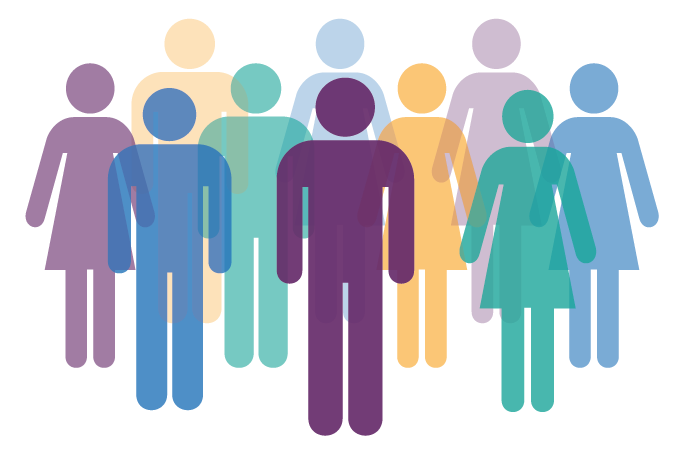 Our automatic update system makes it so we can respond to your feedback quickly. Arreya is always up to date. Nothing for you (or your IT team) to manage or worry about. Have a new feature request, or want to report a bug? Contact us here – support@arreya.com Want to stay on top of the latest developments? Check out our release notes blog here. Arreya can schedule too, right? Of course! This is one area that is similar to Chrome Sign Builder. 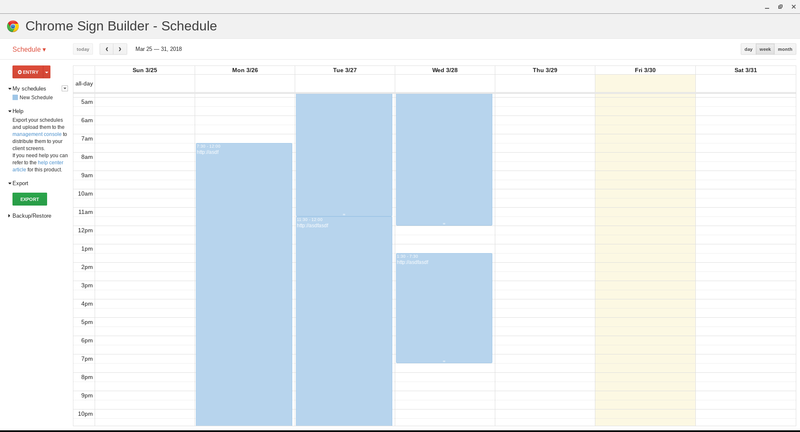 Arreya has a similar schedule interface, allowing you to schedule what presentation shows on your channel. We also give you a preview of your content and a quick link to open it in the Arreya Creative Studio. TL;DR – Chrome Sign Builder doesn’t do anything more than scheduling. If you have content and understand the technical nature of how to use it, it might work for you. 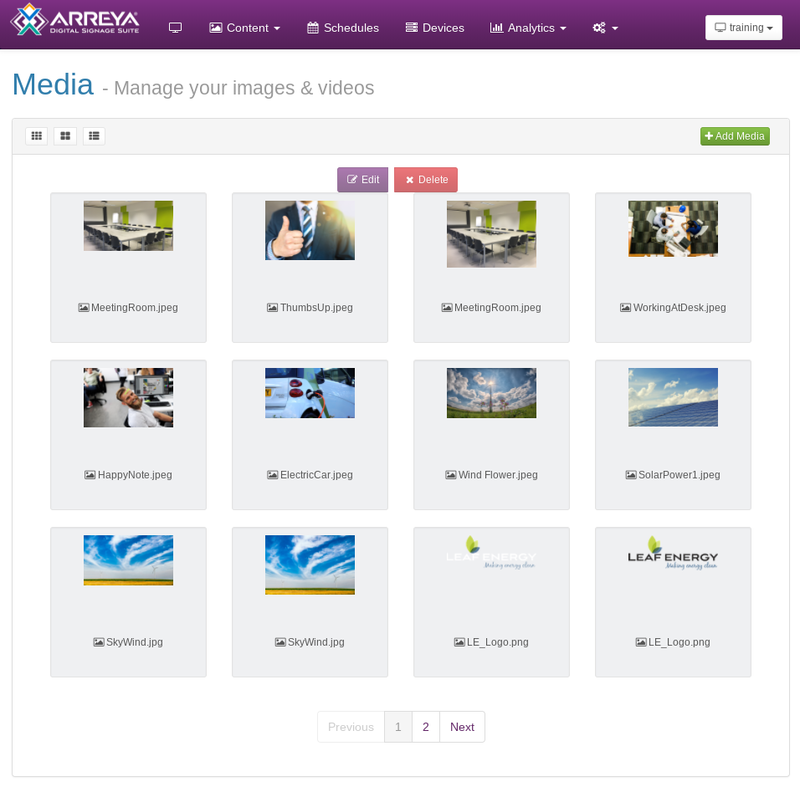 Arreya packages everything in one easy to use web interface – sign up, create content, and deploy it.